New stickers declare "I voted!" in several languages (left). 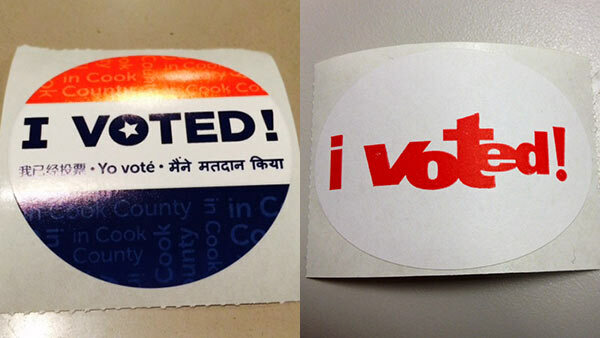 They replace a simpler sticker (right) distributed by Cook County election judges for the past 13 years. COOK COUNTY, Ill. (WLS) -- Even before the polls closed Tuesday, an early winner surfaced in the April elections: New "I voted!" stickers in suburban Cook County. "The Cook Co. stickers are so much cooler," declared a Twitter user @chernowa. The new, multi-colored stickers declare "I voted!" in several languages. They replace a simpler one-color sticker distributed by Cook County election judges for the past 13 years. "We have gotten a lot of great feedback already," said Courtney Greve, a spokesperson for Cook County Clerk David Orr. What's the reason behind the switch? The clerk's office said it simply ran out of the old stickers so they figured it was time for a redesign. The new multicolored stickers cost $ 0.0035 each, which the Clerk's office estimates may end up being slightly cheaper than the old stickers. The new batch of red, white and blue stickers is expected to last a minimum of five elections. Chicago residents will have to remain content with simple slips of paper to prove they voted. The Chicago Board of Elections has no plans to switch to stickers. "Stickers end up on doorways," board spokesman Jim Allen told ABC7. "Our polling place owners don't like spending a day with a razor blade scraping them off."